For this example the single engine VPLEX System has 50% of the available back-end ports connected: E1-A1-FC00, E1-A1-FC01, E1-B1-FC00, and E1-B1-FC01. 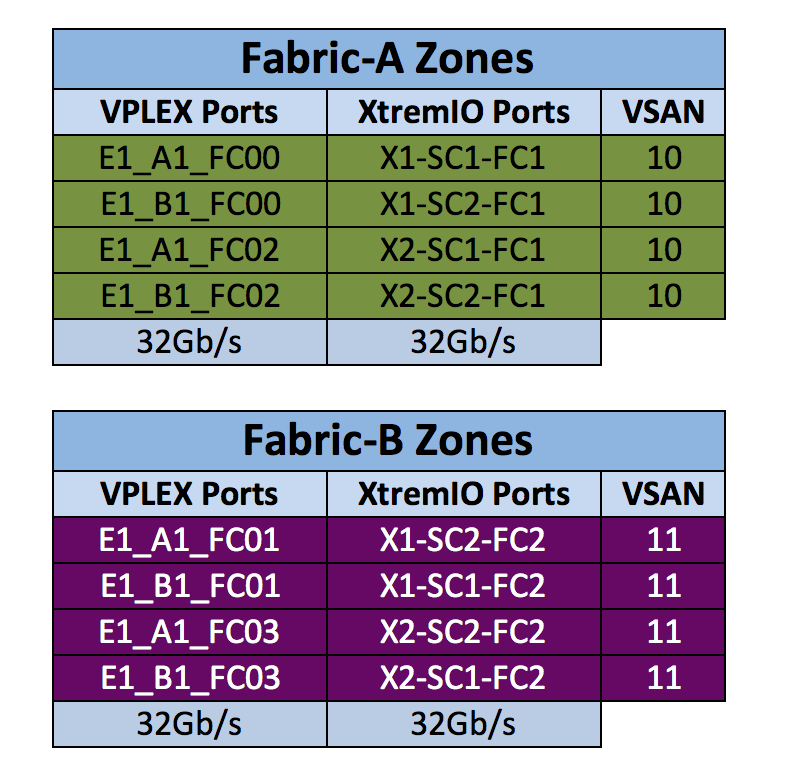 This allows for a 1:1 mapping of VPLEX->XtremIO ports which equates to a total bandwidth of 32Gb/s between VPLEX->XtremIO. 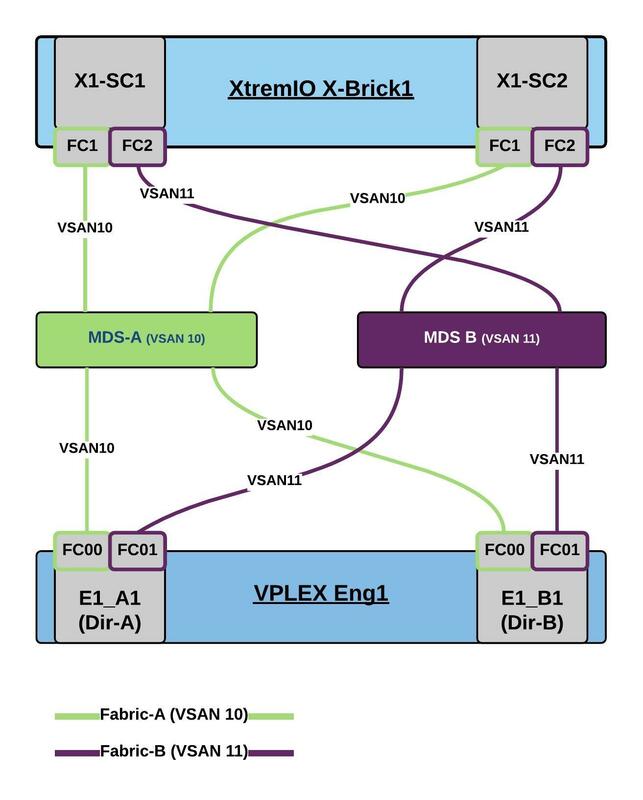 This design meets VPLEX HA requirements as each VPLEX director is zoned to both XtremIO SCs. 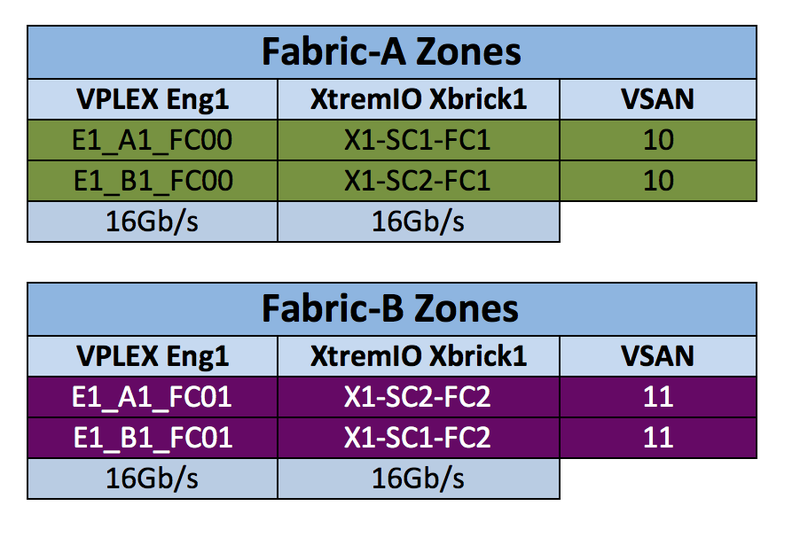 The design also allows for future scalability of the XtremIO cluster as the remaining VPLEX back-end ports, E1-A1-FC02, E1-A1-FC03, E1-B1-FC02, and E1-B1-FC03 can be used to upgrade to a Dual X-Brick XtremIO configuration at a later stage (next example). At this stage we now have 4096 Mappings and 4096 Volumes presented to VPLEX with 50% of volumes mapped to 50% of VPLEX BE ports FC00 and FC01 and the remaining 50% of volumes mapped to ports FC02 and FC03. The above example allows to scale to the maximum limit of 4096 volumes but if there is no requirement to scale beyond 2048 volumes then a single XtremIO IG may contain all 32 VPLEX BE ports. 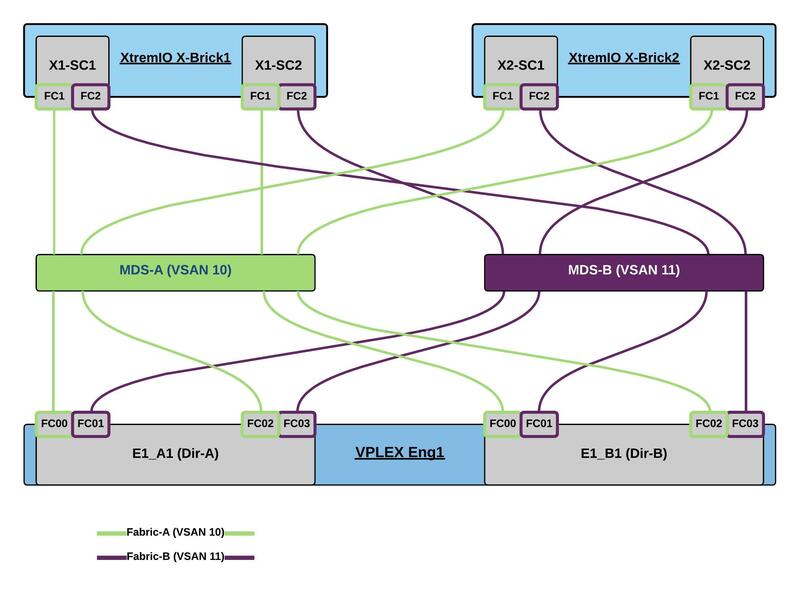 This recommended best practice configuration would apply to any combination of XtremIO X-Bricks to VPLEX Engines. While the following examples provide the associated Cisco zoning for their respective configurations, in the case where ViPR is part of the solution you may chose to either manually complete this task as per the example scripts below which is seamless to ViPR or let ViPR automatically handle this zoning configuration task. 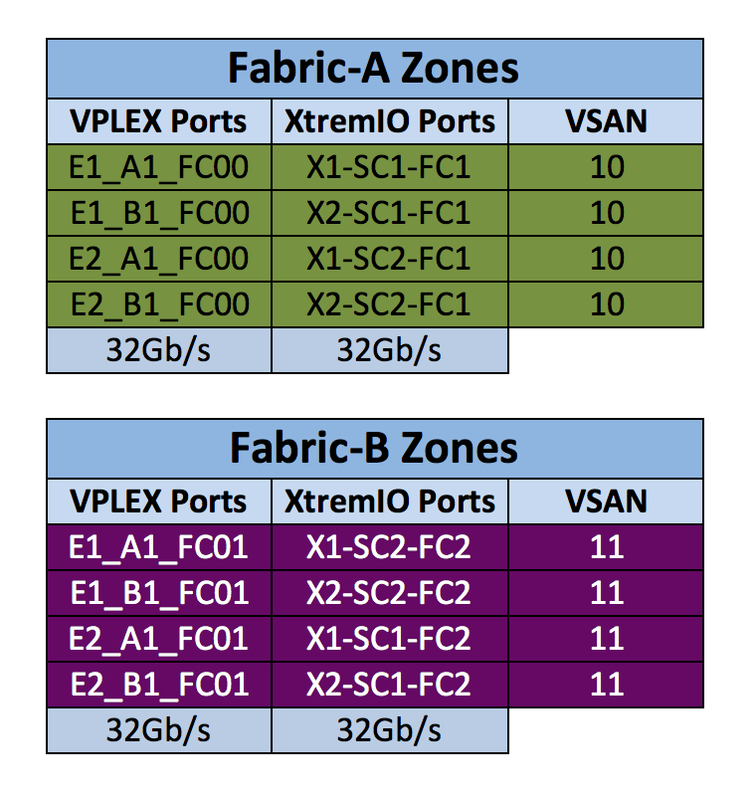 As an example if you chose to allow ViPR to automatically configure the Back-end zoning and you only require at the time to use 50% of the available VPLEX BE ports (depending on the VPLEX-XtremIO config and future scalability requirements) then you can manually tell ViPR to use only the FC00 & FC01 director ports, ViPR follows VPlex-XtremIO best practices and chooses ports based on maximum redundancy. 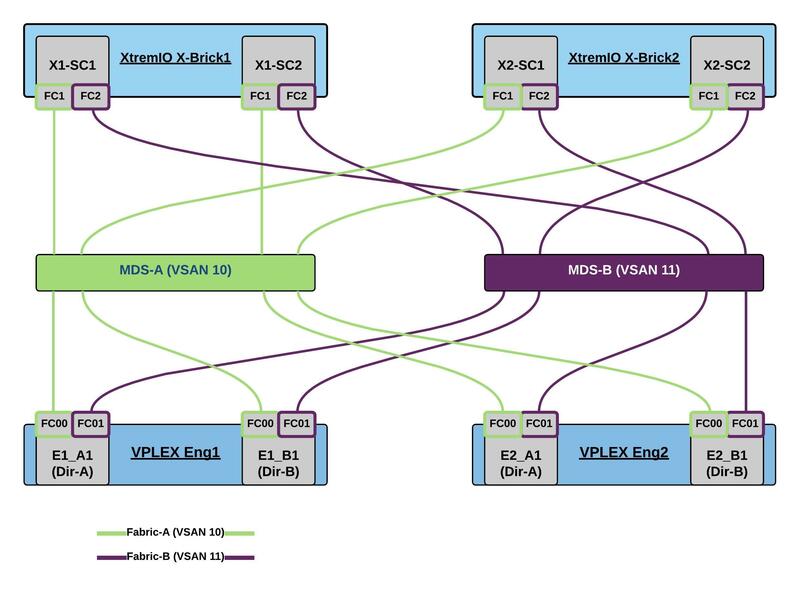 Where the number of X-Bricks is less than the number of VPLEX Engines ViPR will automatically zone 2 Paths Per VPlex Director allowing the flexibility to scale the number of X-Bricks as outlined in the examples below. Another point to note is ViPR at present in the case of a VPLEX-XtremIO solution recognises only a single XtremIO IG thus a 2048 volume limit applies when using ViPR. Regarding EXAMPLE 3: Dual VPLEX Engine & Dual XtremIO X-Brick, what is the impact if we used the four back end port of each director ?